A seizure doesn’t always imply epilepsy. In the case of a seizure, there are things that a neurologist may look at to determine the cause of the patient’s seizure. Seizures occur when abnormal electric signals from the brain change the way the body functions. There are many different types of seizures, which may cause anything from convulsions, muscle spasms, brief or prolonged loss of consciousness, strange sensations and emotions, and/or abnormal behaviors. Seizures can be triggered by an isolated incident such as high fever, infection, exposure to toxin, and metabolic abnormalities like hypoglycemia, but are frequently evidence of an underlying medical condition. While many patients will respond to anti-seizure medication, for 20-30% of patients with epilepsy, the medication is not enough – these patients are “idiopathic” and do not respond to traditional epilepsy medications. 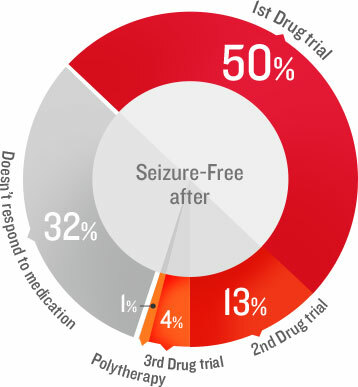 Almost 47% of patients will become seizure-free with the first anti-seizure medication trial, and an additional 14% of patients with a second or third medicine. Despite medication, about 20–30% of patients with epilepsy will continue to have more than one seizure per month, 12% will have weekly seizures, and 8% daily seizures. For approximately 50%, the cause of the epilepsy is unknown, making treatment decisions more difficult to make.